An exciting young British vocal talent, Rebecca Ferguson, brings Motown cool and impressive courage to perform her own material, in her debut album Heaven. 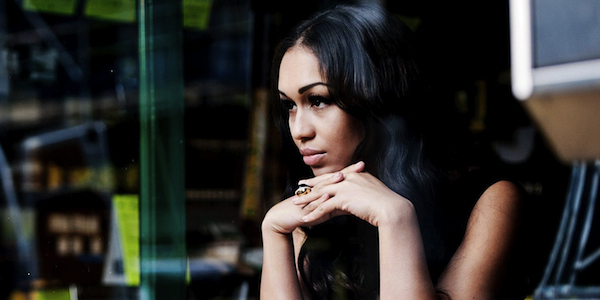 As part of my ongoing meditation on becoming a writer, I’ve taken great interest and strength in a young British R&B singer, Rebecca Ferguson, whose debut album Heaven is getting heavy and well-deserved coverage here. Ferguson was the runner-up on one of those ghastly gladiatorial reality TV talent shows – Britain’s Got No Talent, The Hex Factor, whatever – and was, from what I’ve read, widely thought to have been the rightful winner. She’s got a powerful, husky, mostly contralto voice and looks great with a lot of big panda-eye mascara, and so joins the ranks of the recent bloom of 1960s-inspired R&B and soul singers (Duffy, Amy Winehouse, Adele, et al) who are reinterpreting the famous sounds of their musical forebears Aretha Franklin, Etta James and Dusty Springfield. Syco [her record label] have been really brilliant – as soon as I put my foot down they back off completely. I just wanted songs I’d written on the album. At first I was going into sessions with writers who’d pretty much got all of the songs done already. But I told management they needed to let me write it because otherwise no-one’s going to think I’m a credible artist. Then they let me just go into sessions on my own – I couldn’t believe it. It’s to Ferguson’s and her management’s great credit that she was allowed to write her own material, rather than become just another pop tart cashing in on her fifteen minutes of fame. It also helped, obviously, that Ferguson and her co-writers can write a good tune and that her music is more of what’s sellable at the moment (in the wake of Adele and Amy’s massive record sales) rather than anything too experimental or unpredictable. But it’s a nice moment to applaud the dividends of long-term investment in a young artist, and allowing her to find her own mode of self-expression. There’s nothing shameful in singing other peoples’ material – I do it all the time, though mostly in the shower – but even more exciting when a person performs something that comes from inside of them. Ferguson sings the album as though she means it, and it feels and sounds authentic without being earnest, and squarely within her natural timbre rather than straining for a sound or an effect that isn’t her. Nice work, sister. I hope she finds great success.